The Cannabis facility occupying the old Kraft plant is owned and operated by FV Pharma Inc. a wholly owned subsidiary of FSD Pharma Inc. In March 2018, FV Pharma signed a joint venture with Auxly (originally Cannabis Wheaton) to provide finance to FV Pharma in return for streaming rights to 49.9% of the product that was grown in the facility – but this agreement has now been terminated. It is not known what the financial penalty might be to FV Pharma. Work on the expansion of the facility was supposed to be completed by December 2018 but has still not been completed. Information is limited but it seems that FSD Pharma is in turmoil. CEO Rupert Haynes has been “terminated” and replaced with Dr. Raza Bokhari, Executive Co-Chairman. 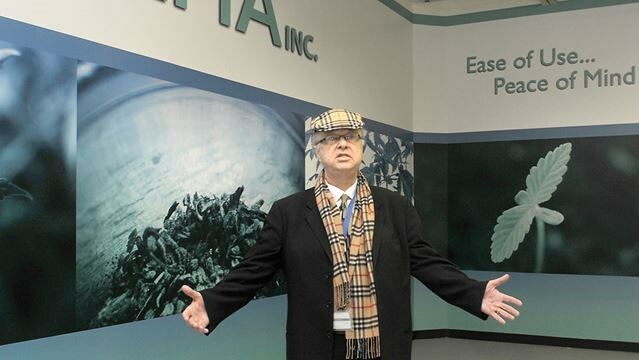 As far as can be determined, Thomas Fairfull is still the CEO of FV Pharma which runs the Cobourg plant. One noticeable change over the last several months is that the focus of FSD Pharma has become medical uses of Cannabis as distinct from recreational. But the termination of the joint Venture brings other concerns. Auxly was to provide $50M in finance as well as management assistance for the first phase of an expansion to a 220,000 square foot self-contained cultivation facility. Currently only 25,000 sq. ft. is operational (photo at right). So far, Auxly has advanced $7.5M of the $50M – it is not known where the balance will now come from. It does not look good although FSD Pharma remains upbeat with the statement that: “The Board believes the Company has unique and invaluable assets and is taking appropriate actions that will support long-term positive cash flow and shareholder value.” (They trade with the ticker HUGE – priced at around 28 – 30 cents). More from Deep Dive – Feb 8, 2019 – Added Feb 9 – Thanks Walter for pointer via his comment below. On February 6, 2019, the Company announced it had implemented changes in leadership and business practices to optimize operations. Accordingly, the Company announced that Dr. Raza Bokhari, Executive Co-Chairman, has been appointed interim Chief Executive Officer of FSD Pharma. To optimize operations, FSD’s Board of Directors terminated a definitive agreement with Auxly Cannabis Group Inc. (“Auxly”) on February 6th, 2019. FSD believes that Auxly was under clear obligation to develop all aspects of the company’s cannabis cultivation facility in mutually agreed upon staged phases. Auxly had made commitments anticipating that the first phase of construction would be completed and ready for Health Canada approval by the end of December 2018 which never materialized. Dr. Raza Bokhari said: “We have a clear plan moving forward to build a global retail and medicinal cannabis footprint. We intend to continue our 220,000 phase 1 building expansion and are assessing different opportunities with other potential strategic partners and construction companies including utilizing our cash, securities and other assets on hand to continue progressing forward. We will update investors as soon as possible and only upon signing of definitive agreements. We will continue to optimize our 25,000 square foot licensed cultivation area adding high value varietals, while utilizing best practices in the latest agricultural science. We are making good progress with the much-anticipated sales license and we have a strong cash and asset position with no debt. In 2018, FSD has made strategic investments totaling CDN $8 million in Cannara Biotech, SciCann Therapeutics (“SciCann”), Hightide Ventures, Huge Shops, and Pharmastrip Corp (“Pharmastrip”). These investments have quickly grown to nearly CDN $25 million as per current market value. Additionally, FSD recently signed royalty agreements with Canntab Therapeutics, Pharmastrip, World Class Extractions Inc., SciCann, and Solarvest BioEnergy Inc. which FSD expects to pay dividends over time. Shareholders of FSD Pharma met in a special meeting on January 22nd, 2019 and authorized the Board of Directors to consolidate class B shares and take additional steps that will enable the company to list on a major US securities exchange. The FSD Pharma Board is actively engaged in evaluating the appropriate exchange and the optimum time to do so. The Company believes these are transformational times for the medicinal cannabis industry and for FSD Pharma shareholders, employees, and stakeholders. Good to see everyone throwing their support behind a start up company that struggled during one of the worst year ending for stock markets around the world, caused by the politics of bickering world leaders. If the end of 2018 had been like 2017 FSD would be sitting at $4-6 a share with everyone laughing and cheering the new jobs but no…….like true Canadians we wait until a potential source of jobs and revenue is on the ground, struggling and then we start kicking it in the head. Congratulations Cobourg………first you lose the cheese company and the over 300 jobs and now the marijuana. You should be in there helping FSD to succeed but no….you’d rather jeer and mock a potential Canadian winner. How American of you. There’s been way too much turmoil at the company since summer of 2018. FSD can’t seem to find sure footing on their strategy. In addition, the stink from the Auxly and Rupert Haynes terminations is pretty heavy. I don’t think either will go away quietly, meaning costly lawsuits, less cash to invest in growth. Raza Bokhari doesn’t have good reviews on Glassdoor with his other companies and interestingly enough, the turmoil started right around when he joined the board. and then there appears to be a new development, a new deal struck with Pharmastrip Corp, as announced on Feb 7. Maybe the recent spate of eulogies is somewhat premature after all. Potential profit attracts many suitors. The whole things gone to pot…. That is a bombshell for Cobourg! Some of us had hoped that FSD Pharma would bring well-paying jobs, industrial assessment to take the load off residential taxpayers and a boost to Cobourg’s ‘sleepy’ image. After all, FSD Pharma would be an ‘industry of the future’ – a world beater getting in on the ground floor opened by Canada’s legalization of recreational cannabis! To be sure, the cannabis industry will be in turmoil for some time with lots of mergers and shake-outs. So let us hope that FSD Pharma can find the financing to carry on with its plans to become ‘the world’s largest hydroponic producer’. And to think that just a mere 24 hours ago you were still drinking, and trying to pass around, the “kool aid”. Yeah and it would be really a belly laugh if they went belly up soon.